short stays and romantic weekends all the year round. 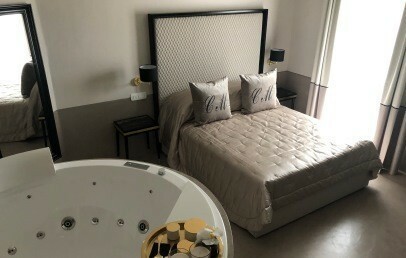 Renting a car will allow you to visit the nearby Emerald Coast and many locations with a naturalistic and archeological interest without renouncing the comforts of the city and the classy service of this intimate hotel. La Locanda del Conte Mameli is nestled in the center of Olbia and offers the perfect place to enjoy the life in the streets in all its positive aspects. The architectures of the historic heart of the province show influences from different culture and eras. 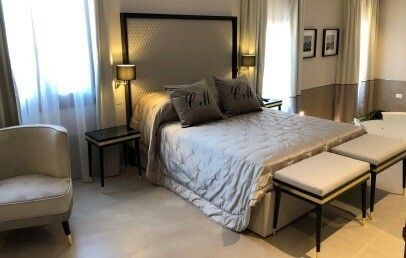 At your fingertips you can do shopping with prestigious designer shops or go out to famous bars in Corso Umberto. La Locanda del Conte Mameli is among the best hospitality facilities of the city. Strategically located, you can discover the capital of Gallura and the areas surrounding Olbia, first of all areas of archeological and naturalistic interest. Only around few km away is the beautiful islands of Tavolara and Molara as well as the Emerald Coast, a paradise of beaches. La Locanda del Conte Mameli was the historic residence of Conte Mameli in the late 1800's. Carefully restored with great attention to detail and to preserve the charm and elegance of ancient time. You may admire the original walls belonging to the old residence characterized by "exposed stone" technique and antique bricks. 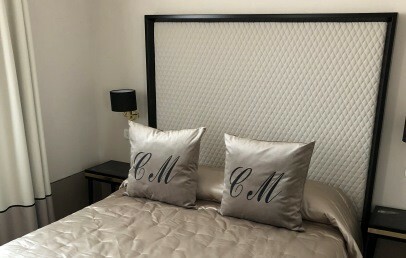 An elegant hotel, luxuriously furnished and surrounds by an intimate and relaxing atmosphere. An additional value deals with the kindness of the owners and with the staff, extremely helpful and welcoming. 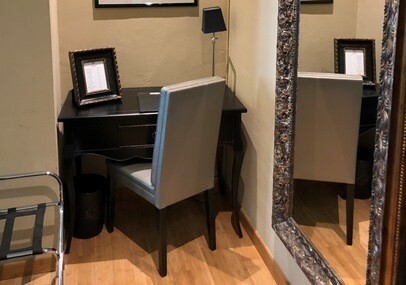 The hotel has nine comfortable double rooms and two suites. 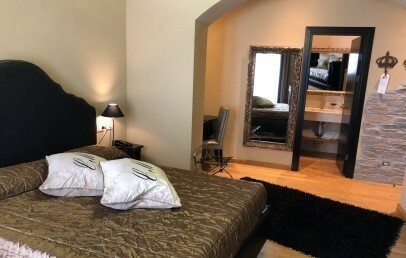 All rooms are soundproofed, have a shower and offer free Wi-Fi. 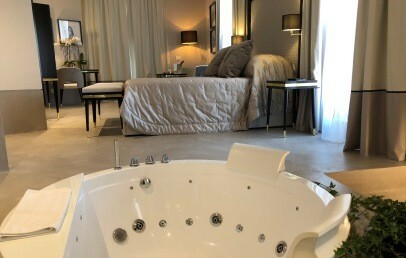 The Suites have also a jacuzzi inside the room. The numerous white sand beaches and the blue sea of the Emerald Coast are just 10 km around from Olbia. The many different charming bays and inlets offer the possibility to practice nautical and swimming activities. Just 10 mins south from La Locanda del Conte Mameli is Porto San Paolo and in only 30 mins by ferry the island Tavolara can be reached. Tavolara is a protected Marina Area, a Mediterranean paradise of inlets, beaches, cays and capes. La Locanda del Conte Mameli offers its guests a breakfast buffet with the best tradition of Italian coffee-making and a delicious fresh bread, croissants and cakes, toast rusks and cereals, butter, jam and honey, yogurt, cheeses and mixed cold cuts, fresh fruit salad, fresh fruits, juices and mineral waters. Breakfast is served in a common and charming area characterized by a relaxed atmosphere while in summer it is served in the solarium terrace. The hotel has no restaurant but the staff is able to suggest associated restaurants, trattorias and pizzerias just meters away. On request the owners of the Hotel can arrange guided tours in the Sardinia inland or excursions by kayak or by jeep or a trekking tour. City tax – of € 2.50 per person/overnight, for a max. of 7 overnights, to be paid on-site. 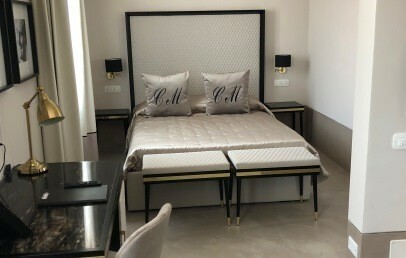 Refined double junior suite with terrace, furnished with a mix of vintage and modernism characterized by clean lines with harmonic alternation of light and dark elements. The interiors are spacious and well-lighted and, in some areas, you may admire the original walls belonging to the old residence of Count Mameli, built at the end of the 1800's with the "exposed stone" technique and antique bricks. The room is sound-proofed. Furnished with a mix of vintage and modernism characterized by clean lines with harmonic alternation of light and dark elements. The interiors are spacious and well-lighted and, in some areas, you may admire the original walls belonging to the old residence of Count Mameli, built at the end of the 1800's with the "exposed stone" technique and antique bricks. Sound-proofed rooms. Furnished with a mix of vintage and modernism characterized by clean lines with harmonic alternation of light and dark elements. 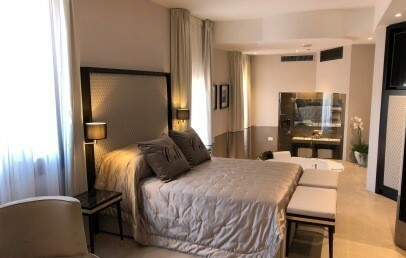 Superior Double Room with more comfort and space compared to the basic room, in a romantic atmosphere. 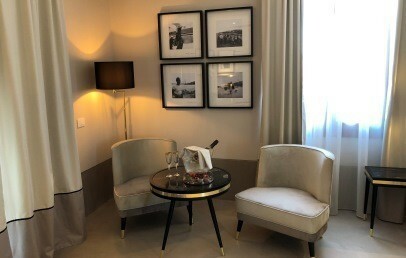 Refined Triple Junior Suite with living corner, furnished with a mix of vintage and modernism characterized by clean lines with harmonic alternation of light and dark elements. The interiors are spacious and well-lighted and, in some areas, you may admire the original walls belonging to the old residence of Count Mameli, built at the end of the 1800's with the "exposed stone" technique and antique bricks. The room is sound-proofed and provided with every comfort. 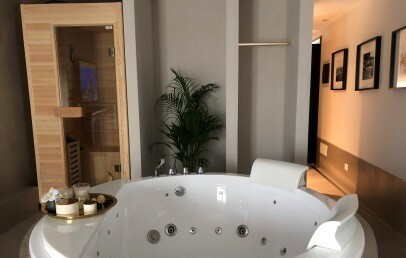 Double Bedroom, private bathroom, Mini Spa for exclusive use with sauna, Jacuzzi and emotional shower, living corner and terrace. 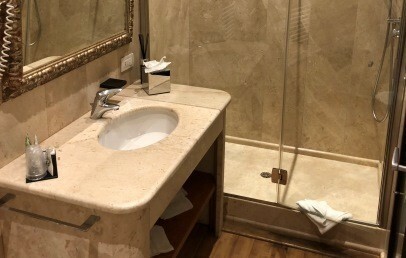 Family Suite with Mini Spa for exclusive use with Jacuzzi, sauna and emotional shower, private bathroom with shower. 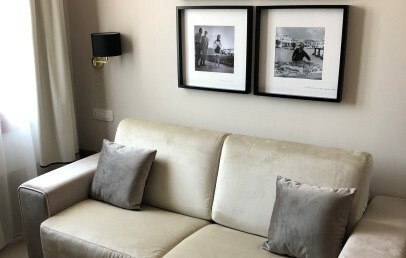 Finely furnished for a romantic and relaxing holiday. Sofà bed in the separate living room. Baby cot for the child up to 3 years old free of charge, to be asked upon confirmation.